Saturday night was kind of a wash in a lot of ways. I came away satisfied with two or three pics, though the Waterfire event didn’t live up to expectations this year. First, three shots from the evening I kind of liked. Alright – for my summation. 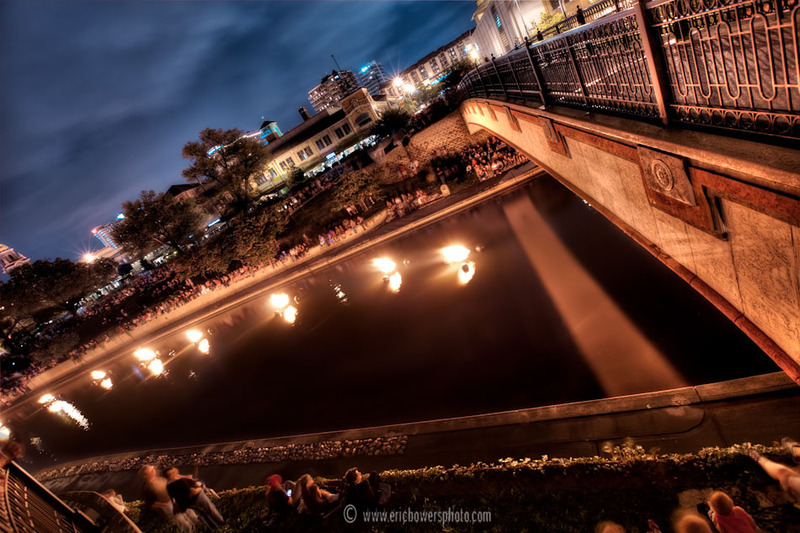 Concerning the Waterfire event on Brush Creek – a public art/performance show first started in Providence Rhode Island that sprung up here in KC as well over the last few years. The prior years’ Waterfire shows took place well into October if I recall. By then the weather was far less humid and stifling than it often still remains in KC in mid-September. So trudging around the creek banks with sweat dripping onto my new camera was my first irritation, as mid September is too early to conduct this event. I’ve seen people comment on prior years’ Waterfire shows. They thought it was either cool and creative , or they just flat out thought it was silly. My own opinion was I liked the “atmosphere and moodiness” of it, so it’s been on my good side, and always makes for fun photography subject material. Scheduling it in mid September when it’s completely common to have lingering summer heat and humidity was not smart. Secondly, there were storms coming through Kansas City that day since the early afternoon. They held off starting the event until 8pm, and shortly after it did start we all received word we’re not supposed to actually “walk” on the Brush Creek sidewalks due to high water concerns. Oh, and there was a Flash Flood Warning. Someone must have missed the memo about how lovely Brush Creek can get during flooding conditions. It would have appeared completely logical to postpone to the rain date, but they tried to go forward with the whole production that night – a gamble which crashed and burned when another round of rain storms showed up and they’d already committed to running the event that night. The Plaza then become quite a traffic jam as everyone was trying to get gone in fairly heavy rain showers. As I was on my way out of the event, I decided to spend a few minutes trying to get a decent shot of the bagpiper playing at 47th and Broadway. The better ISO capabilities of my new 5D Mark 2 over my original version 5D aided greatly in this kind of low light shot. Right after that I got back to my car just as it was beginning to pour. Summation: Waterfire: I like you, but be smart about things. Don’t schedule in September when there’s too much potential for the heat to be irritating, and don’t be afraid to err on the side of caution concerning rain date postponements. I’m glad I got a few pics of the event despite the fiasco, but it would have been better for everyone concerned to save them all the irritation and to just postpone to the rain date (sorry if I’m playing Captain Obvious with that last statement). 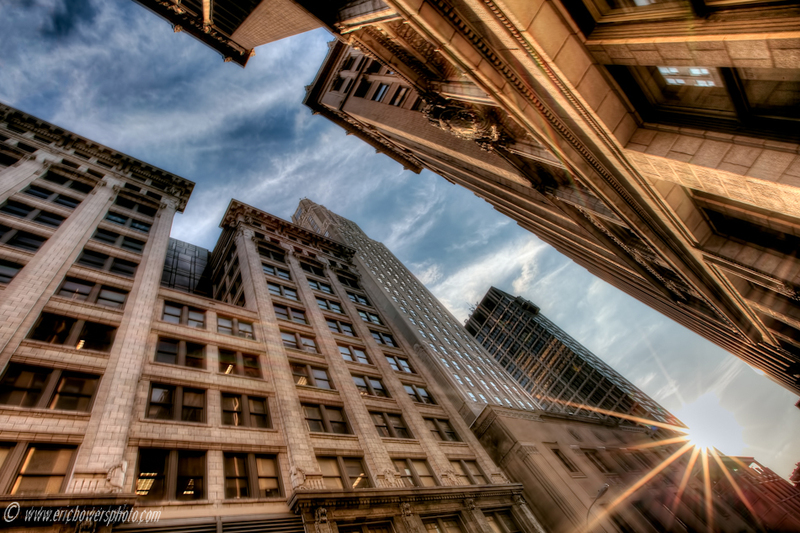 Another photo from Thursday evening when I was running around playing with my new Canon 5D Mark II. 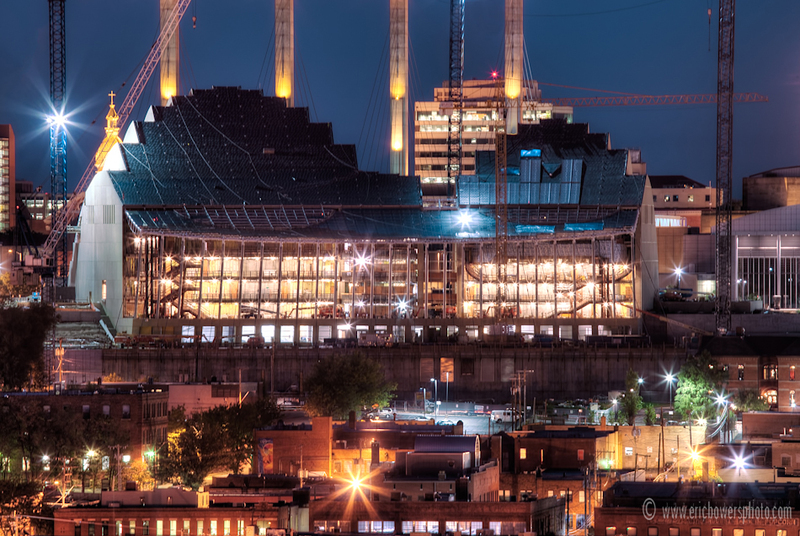 I figured I might as well end it with another Kauffman Center shot. I ordered a new Canon 5D Mark II so I could retire my old workhorse original version 5D to a leisurely life serving as a backup or secondary camera body when I need to use a couple different types of lenses at the same time. 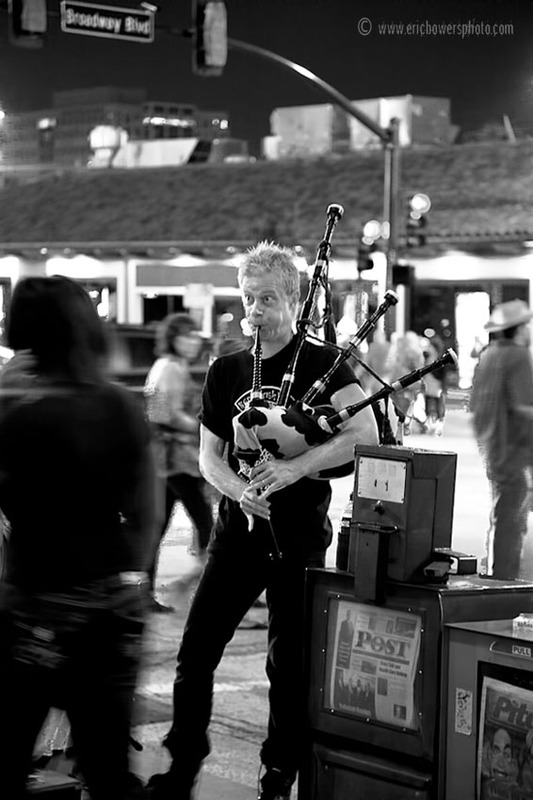 So seeing as the new 5D II arrived Thursday I went out in the afternoon and evening roaming around downtown. This shot was on 9th Street between Grand and Walnut, I believe. My old 5D was starting to show some signs of wear, and its technology is now a bit dated compared to what the 5D Mark II provides. Funny thing though is the 5D Mark III, assuming that’s what it will be called, is expected by the photo community rumor mongers to show up in about six months to a year. I decided not to bother waiting. Actually for this particular photo I’m posting, I like the overall composition, but there are some things about it that annoy me, although I’m posting it anyway. I didn’t keep my shutter speeds fast enough for the three handheld, bracketed exposures for HDR, and therefore when magnified on the computer monitor I can see problems. Whatever. I’m giddy to have a new 5D Mark II to work with. Coming up this weekend is a hot air balloon festival, a red light camera protest to be held by the Liberty Restoration Project, and the Waterfire event at Brush Creek on the Plaza Saturday night. 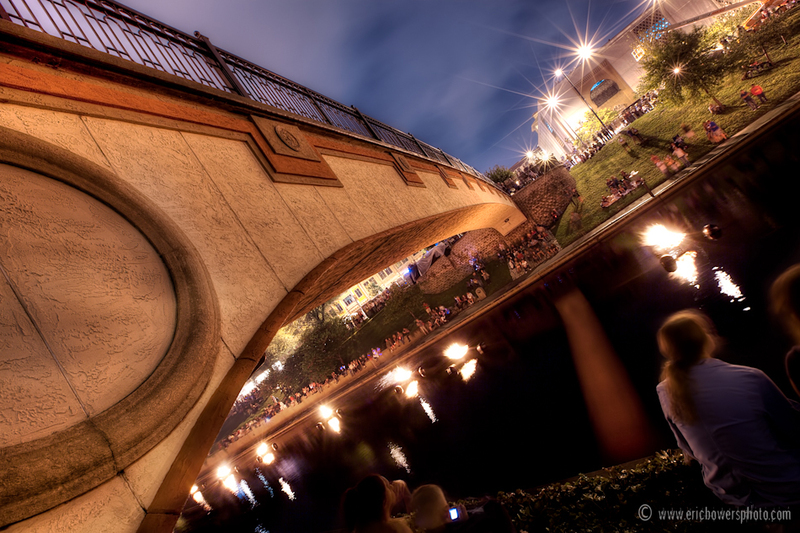 I’m going to try and make good and sure the new camera doesn’t end up at the bottom of the creek, as I’ve had some bad luck before concerning equipment damage at Waterfire – nothing that couldn’t be repaired though, thankfully. During the Fiesta Hispana I had the idea to go hop into the skywalk connecting the Marriott and Muehlebach Hotels at 12th and Wyandotte and see if anything interesting was to be had from up there. I tend to gravitate towards these kind of window/glass reflection things like this, and they’ve actually led to photo sales in the past. 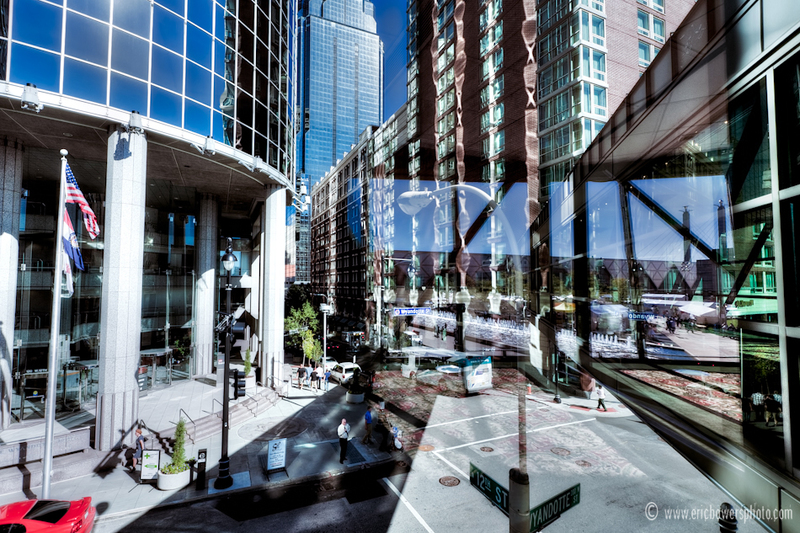 Here’s another shot I took down on the street underneath the skywalk just over nine months prior on January 2nd, 2010. In this photo above I’m pointing the camera and lens toward the southeast, though with the reflection coming in from the glass behind me, you can see the Bartle Hall convention Center and a couple of the Skystation pylons as well, although those are actually to the southwest of where I was located. Between the One Kansas City Place tower and the Muehlebach Hotel, you can kind of see an air vent inside the skywalk I was situated in. Crazy visual complications like that get me all excited. 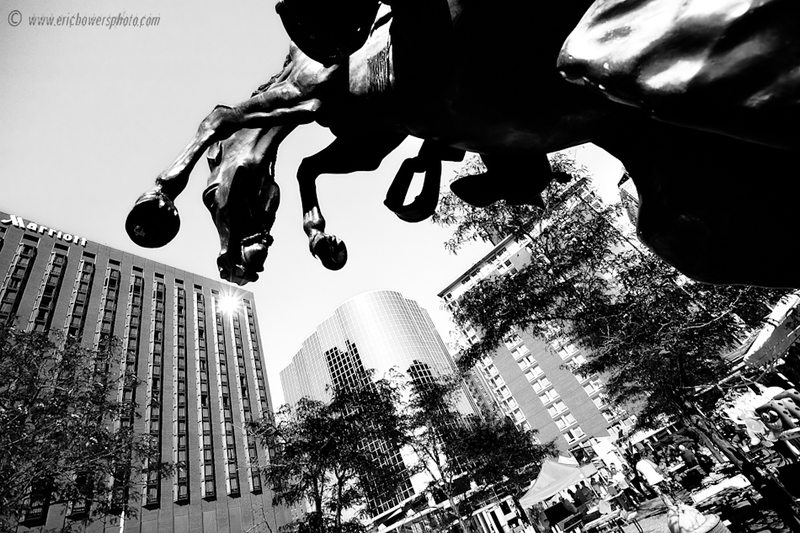 This past weekend was the Fiesta Hispana at Barney Allis Plaza in downtown KCMO. Honestly I did not get any actual good photos of anything pertaining to the festival itself, although I did nab a couple of general, urban scene type of shots, this being one, and another coming tomorrow. Here we have quite a horse statue in the park across from the Marriott Hotel, with the old art-deco Municipal Auditorium behind.